If you have been battling athlete’s foot, toenail fungus or just very smelly shoes and can’t seem to get on top of the problem, you should consider investing in a shoe sanitizing machine. These inexpensive, easy to use devices can kill not only odor-causing bacteria but some models can help to get rid of the fungus and bacteria that cause toenail fungus and athletes foot. They are also recommended for people living with diabetes who may be at risk for infections that could result in amputation. Some sanitizers can kill up to 99.9 percent of fungi and bacteria in your shoes and are often recommended by Podiatrists after completing treatment for fungus infections. Why Use a Shoe Sanitizer? The fungus spores and microbes that cause foot fungus are notoriously tricky to get rid of. Many individuals find that even after treatment they are faced with re-infection and foot fungus becomes a chronic problem. Microscopic fungal spores spread quickly and easily and get on everything including socks, all types of footwear, towels, and bedding. No one wants to throw out all of their shoes each time a re-infection occurs, and footwear is usually tough to clean, especially on the inside and when you are wearing them every day. When you use a shoe sanitizer daily, it becomes an integral part of a complete treatment to help prevent recurrence of foot fungus. Sanitizers work by disinfecting the inside of shoes by using either ultraviolet (UVC) light or by using a gentle heat with ozone. Using UVC light to kill bacteria is a technology that has been used in hospitals for years to help keep equipment and hospital room sterile. UVC light is generally considered safe to use, although you must ensure that you never look at the UVC light or touch it to your skin. Usually, these types of devices are used in a dark environment or put into a bag to ensure that there is no chance the user will be exposed to the light. A few sanitizing devices use ozone to sterilize footwear. Ozone has also been used for many years in different types of industries like hospitals, hotels, and food processing to kill bacteria. The SteriShoe+ is our top pick if you are looking for a good quality, clinically proven, reasonably priced sanitizer. The SteriShoe+ has some improvements over the original SteriShoe which has been sold since 2008, including a treatment time of 15 minutes (the original model has a treatment time of 45 minutes), it can treat the entire shoe now and the one-size-fits-all footwear. If for some reason footwear won’t cover the light sensor, you can put it in the black bag. It uses UVC light to sanitize the inside walls and has safety features to ensure that it won’t turn on if it isn’t being used properly. It earned a Seal of Acceptance from the American Podiatric Medical Association and is recommended by over 1,000 doctors. It can kill up to 99.9% of the germs that cause odor, athlete’s foot, toenail fungus, and warts. 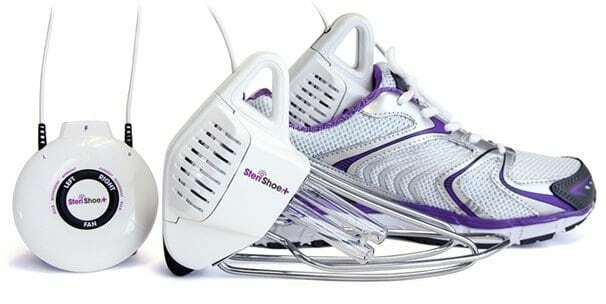 It is straightforward to use, all you have to do is place the SteriShoe inside your footwear and plug it in, after 15 minutes it will automatically turn itself off. It comes with citrus-scented cartridges to help deodorize footwear with a freshening scent. The manufacturer offers a 30-day money back guarantee. (Continental U.S. sales only). 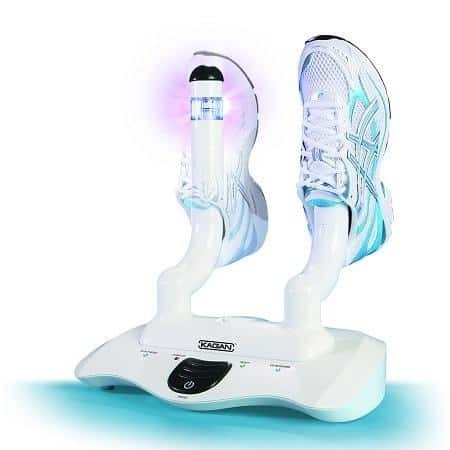 Shoes UV Sanitizers Sterilizer with Switch is an excellent option if you are looking for a more budget-friendly device. It uses ultraviolet light and ozone sterilization and claims a sterilization rate of 99.9%. The treatment time is also only 15 minutes, and the replaceable bulb has a lifetime of approximately 8000 hours. This model will fit most types of shoes. 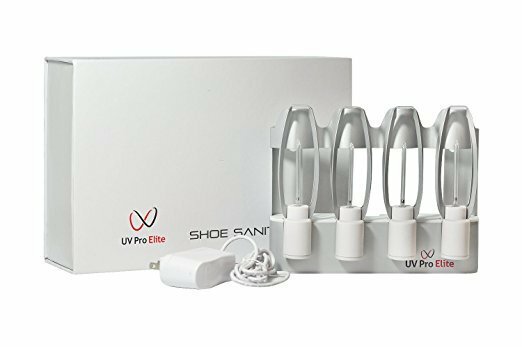 The UV Pro Elite Shoe Sanitizer is one of the pricier options that is available. It uses wireless technology to kill the germs more easily and conveniently. You don’t have to use this device only on your footwear; it can be used on lots of different items including sports equipment. It is tiny, so it is easy to take when traveling. It has a safety feature that ensures the device doesn’t turn on while you are holding it, as well as a delayed start, so it doesn’t turn on until after you have placed it where it needs to go. It uses UV-C wavelengths of ultraviolet radiation to kill 99% of bacteria and germs. The StinkBoss has a much different design than our other top picks. The idea is that you place your footwear inside the StinkBoss device and the enclosed design allows the ozone to circulate throughout your shoe, sanitizing it on both the inside and the outside. It doesn’t use UV light but kills bacteria using ozone and mild heat. It produces zero waste and is considered environmentally friendly. You can use it for shoes as well as other gear like hats, glove, sports equipment, and most delicate materials. It only claims to kill the bacteria that causes odor; it makes no claims about killing foot fungus. 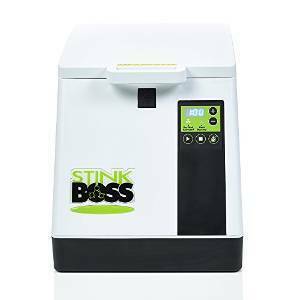 The StinkBoss has various cycle times from 30 minutes to 6 hours, and it comes with a one-year limited warranty. The shUVee is another option if you are looking for a different style of design. It works on most shoes and boots in less than one hour and claims to kill 99% of common germs & bacteria that cause foot odor. It does not claim to kill bacteria and fungi that cause athletes foot or toenail fungus. So if you need to get rid of smell, this is one option to consider. The devices that use ozone are also safe to use as the ozone generated complies with UL Standards which regulates household use of ozone. Not all UV sanitizers are created equal; most will kill the smell from your footwear, but to get rid of bacteria and fungus you will need to get the right product. There have been some independently published studies that confirm that devices like the SteriShoe+ do get rid of up to 99.9 % of fungus in footwear that is tested. Sterilizers are often sold and recommended by podiatrists after professional laser treatments for fungus and are generally considered by most experts to be a useful tool in the battle against fungus re-infection. Safety features – Since UV light can be damaging to your eyes, it is essential that any device you purchase has the safety feature of an automatic shutoff if the UV bulb is exposed to regular light. It is especially important if you have children or pets in the house. You should also check to make sure if you are buying a product that uses UV light that it also includes a bag to put the footwear in if you are sanitizing a type of shoe that doesn’t fully cover the UV bulb. Size – Some of the older models (including the original SteriShoe) only fit a certain size, so you have to choose between a small, medium or large model. Newer models are one-size-fits-all and can be shared between family members. Treatment time– Treatment times vary from about 15 minutes to 6 hours. As the technology improves so does the treatment time, obviously, the shorter the treatment time, the more convenient the product will be to use. The more you use the sterilizer, the higher your chances of successfully getting rid of odor and bacteria in your footwear. Replacement parts – The UV light models will require you to (most likely) have to replace the bulb after about two years since the power and effectiveness of the lamp decreases in strength over time. 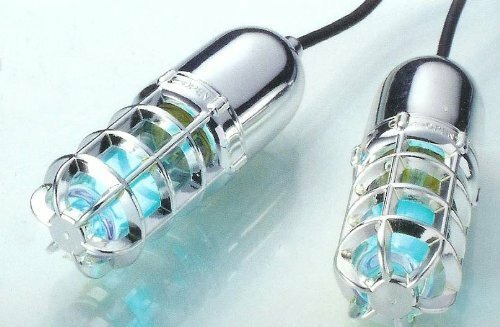 Replacement bulbs for the SteriShoe+ are around $15-$20 and can be found on their website. Heat – A few devices use heat as part of the sanitation process, but the heat is usually so low that it is unlikely to damage fabric or material. If you are trying to get the odor out of a particularly delicate fabric check the level of heat that is used to ensure that there is no possibility of damaging material. Types of shoes it can treat – Most sanitizers will work with all kinds of shoes including sandals, high heels, boots or most types of materials. Check the specs of any product you are considering to ensure that it comes with a protective bag if you are going to be using it on sandals or open-toed designs. Warranty – The standard warranty for the most popular sanitizers is a limited one year warranty. How often do you have to use these devices to keep shoes from smelling? Since the treatment time on the latest devices is so short, it is recommended that you use sanitizers daily whenever the footwear is worn. How do you determine if they are working? If you are using a sanitizer to eliminate odor the obvious way to determine results is by the smells disappearing. Determining whether fungus microbes have been killed is not something that you will be able to measure by the naked eye. The best indicator that the devices are killing off fungus bacteria is whether you have a reoccurrence of a foot fungus infection. If you are using a high-quality product like the SteriShoe and are still faced with re-infection, ensure that you are also correctly cleaning bedding, towels, socks and any fabric where fungus can be hiding. If you are unsure of a product that you have bought, it is best to go to the company website and check any clinical studies that have been done on the product. Can these devices be used on different footwear? Most of the sterilizers on the market are designed to be used on all different types of footwear including sandals, open-toed, heels, and boots of any size. You can use the products interchangeably with family members as there should be no chance of passing an infection on to another shoe. Although always check for specific instructions on any products that you are considering purchasing. Whether you use a foot sanitizer to help with odor or you use them to kill fungus to help stop re-infection, these products can be a beneficial addition to your household. Since shoes and boots are tough to clean and it is incredibly challenging to get rid of foot fungus these devices are a great tool to help with everyday hygiene.